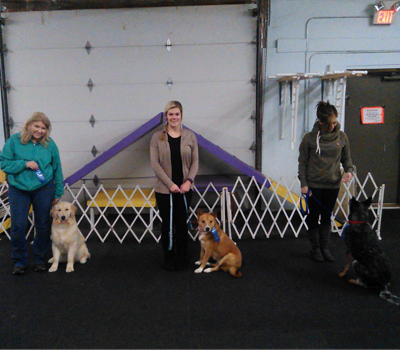 "Photo above February 21 STAR Puppy graduating class"
JOIN US FOR THIS MUST DO SEMINAR! You are not alone. BUT you can learn how to help keep them under control. If anxiety or "Ring Nerves" is affecting your performance in any dog sport, this is the seminar for you. You can conquer ring nerves with Mental Skill Training to be the handler your dog needs and deserves. Learn to handle the jitters and focus on giving the best team performance. Working spot teams will role play with their dogs and all attendees will benefit from learning and practicing the proven techniques. "Don't let your head get in the way of Performance!" 2019 OBEDIENCE & RALLY RUN-THRU'S ENTRY FORM - PRE-Entries Only. BRING THAT NEW PUPPY OR RESCUE DOG FOR SOME FUN TRAINING AND BONDING TIME, OR MAYBE TAKE A REFRESHER COURSE. COME! JOIN ONE OF OUR CLASSES! Bring your puppy/dog to a fun class! The Obedience Dog Training Club of Waterbury, Inc. was founded in 1946. The club is dedicated to the training of dogs and their handlers both for fun and for competition. We believe that all dogs benefit from obedience training and have helped thousands learn to train their dogs both for a better-behaved pet or a highly trained obedience competitor. We provide all phases of training – Beginner through Utility and we also offer Agility training. We also provide Canine Good Citizen testing for those dogs that graduate from our classes. Our instructors are successful obedience and agility competitors – they are constantly seeking new and innovative teaching methods to fine-tune their instructional skills. It is our intention to encourage and promote the sport of dogs, their health and training and hope that you will use our facility in that spirit. We are conveniently located approximately 5 minutes from Exit 16 off of I-84. Prerequisite CGC or equivalent training. This class works on novice competition and therapy dog skills. WEDNESDAYS 6:00 P.M. This class fee is $15. More info on our classes page. CHECK OUT ALL OUR CLASSES - FIND ONE TO FIT YOUR INTEREST AND JOIN US FOR THE FUN! Congratulations to all our graduates. From all of us @ ODTCW.